Festive wreaths have been hung and Christmas lights have been strung around campus, sure signs of the upcoming holiday. 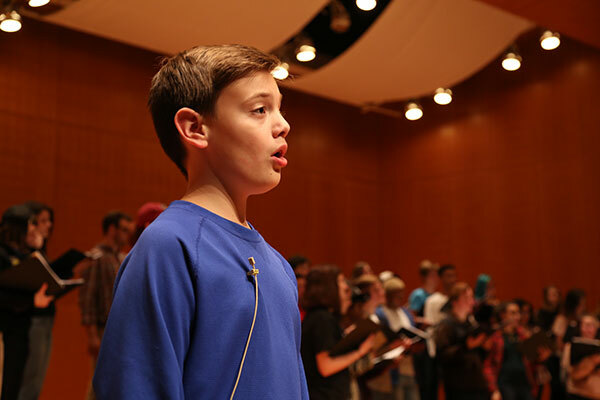 The Service of Nine Lessons and Carols, considered by many to be the official kickoff to the season, will be at 7 p.m. Sunday in Callaway Auditorium, followed on Tuesday by Christmas on the Hill from 5-7 p.m. and a holiday concert by the band and percussion ensemble from 7-8:30 p.m.
Debbie Ogle, Assistant Professor of Music and Choral Director, said the annual Lessons and Carols is patterned after the original service at Kings College in Cambridge, England. Lessons and Carols began at LaGrange College in 2001, and Ogle said it is the perfect way to celebrate the Advent season. Poignantly, Jack is the grandson of late Biology Professor Dr. John Hurd, and the son of Johnny Hurd Ed.S.’11 and Racheale LaManna Hurd ’06. Jack’s grandmother is Margaret O’Gwynn Hurd Lawson M’89. Readers who will deliver the Christmas story include President Dan McAlexander; Mayor Jim Thornton; board members Bobby Carmichael, Dr. Jim Bruce and Dee Dee Williams; student, Presidential Scholar and Servant Scholar Coral Douglas; and professors Dr. Toni Anderson and Kim Barber Knoll. Ogle thinks the tradition of Lessons and Carols is reassuring in today’s world fraught with turmoil and discord. The ever-popular Santa and his live reindeer are making a return appearance Tuesday at this year’s Christmas on the Hill. 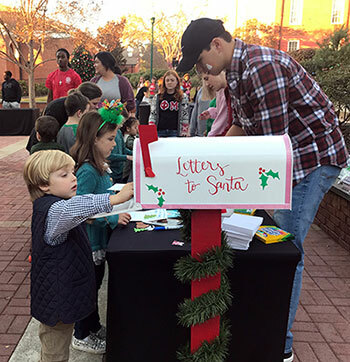 The event also will feature holiday crafts, Santa Sumo, a holiday train around the Academic Quad, Letters to Santa and games. Funnel cakes, pizza and holiday nuts also will be for sale. Caroling and a tree lighting ceremony will be held at 6:30 p.m. Although not mandatory, a donation of $5 (cash only) or canned food products will be appreciated. The food will benefit Our Daily Bread soup kitchen, created and maintained by LC students. Later Tuesday night, the college’s instrumental ensembles will present “Sounds of the Season” at 7 p.m. in Callaway Auditorium. The program will include Christmas selections from the wind ensemble, percussion ensemble and jazz band. Admission is free. The Panthers (4-1, 1-0 USA South) overcame a 14-point deficit in the second half to win 76-68 at Piedmont on Tuesday in a USA South game. Senior forward Jalen McCallum had a school NCAA era record nine blocks to go with 12 points and a career-high 15 rebounds. LC plays at USA South foe Covenant today (Friday). LC (4-2) went 1-1 at its own USA South/SAA Classic Tournament last weekend. The Panthers beat Berry on Saturday before losing to Oglethorpe on Sunday. LC plays at Berea on Friday and at Maryville on Saturday in USA South games. The Panther swim teams will compete in the SCAD Invitational in Savannah, Georgia. The meet begins Thursday and runs through Saturday. The fourth annual Sophomore Retreat will be March 1-2 at the Historic Banning Mills. Interested students should apply by Monday. Space is limited. For more information, contact Dr. Karen Pruett at the Center for Leadership and Career Development at kruett@lagrange.edu or 706-880-8997. The Panther Toy Store will be held during Christmas on the Hill on Tuesday. Volunteers are needed to help set up, wrap presents, take down and work during the event. For more information or to sign up, contact Coral Douglas at cdougla2@student.lagrange.edu. This opportunity is considered service hours. The box office is open now for LaGrange Theatre’s next production, “Blithe Spirit,” running Dec. 7-11 in the lab theater in Price. More information about the show will be in next week’s @lagrange. Tickets are $10 for adults, $8 for senior citizens (55 and older) and non-LC students and free for LC students faculty and staff. The box office is open weekdays from noon until 4 p.m. Email to make reservations at priceboxoffice@lagrange.edu, or call 706-880-8080. If emailing or calling, please leave name, the performance date/time and number of tickets desired, type of tickets and a call-back number and email address for confirmation. John Mitchell Benton, a senior History major and Political Science minor, presented his paper, “The Impact for One Crucial Action/Terrorist Act to Hypothetically Shift Support to Those Who Advocate for More Security,” at the annual meeting of the Georgia Political Science Association in Savannah, Georgia, on Nov. 9.